In the last post we discussed the way in which we can get many variations from using as little as 7 or so Denisovan figures. In this post we talk about painting aboriginal warriors. Skin color for aboriginal warriors tends to be on the dark brown to black side. Naturally enough in the small scale of 28mm some ‘lightening’ of the color needs to be done so the figure isn’t lost on-table by the use of highlight colors, etc. As aboriginal peoples are dark skinned so we need a tone of color that tends toward this shade to best represent them. A number of Foundry paints are usable but I use a spray can color as described below. For those even remotely interested in the subject it is clear that body painting and personal ornamentation is a tradition which carries deep spiritual significance for the aboriginal people. Cultural rituals, including body painting, differ between tribes and topographic location. It was often recorded by colonists who fought aboriginal warriors that war paint was typical. The specific designs and motifs show relationships to their family group, social position, tribe, precise ancestors, totemic fauna and tracts of land. Countless other examples exist of accounts describing the use of warpaint by warriors. There are very strict guidelines as to how body painting and adornment is carried out and an Aboriginal warrior is not allowed to just use any motifs or adornment in their transformation. They followed traditional patterns unique to their tribal group. For example, in Arnhem Land they are painted in tribe/clan totems to the upper body and thighs. 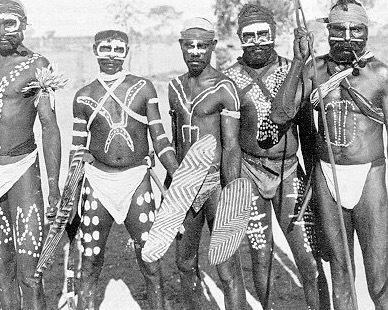 In Eastern Arnhem Land (Yolngu) the men are painted according to their clan/blood line. Colour varies between different regions of Australia and tribes. Clay is often used as a colour source, as is as ochre, subject to availability. Many tribes use precise colour pairing such as pink and red or yellow and white. Feathers, leaves and plant materials are also used to add colour to arm and leg ornaments. Animal fat was often mixed with paint so that they stay longer on the body because most ceremonies last for days. The Tiwi on Bathurst and Melville Islands (off the coast of Northern Australia) also have a thriving tradition of body art. They decorate face and body in particularly strong designs. In Northwest Queensland, men rub their foreheads with charcoal and paint a white band from either eyebrow down the front of the ear and along the shoulders and arms. White and red bands are painted across the chest and the rest of the body is covered in red. As you can see, much variation is possible. Aboriginals also use different items and ways to decorate their body including scars, feathers, shells, teeth, ornaments, face paint, and body paint. Symbols are much used and can represent many things about the person who uses it. It is often used to tell a spiritual story. Scarring used to be common practice done by males to denote their social status. Sharp shells or rocks were used to cut the skin and then rubbed with ash or other irritating material to inflict a permanent scar and skin discoloration. From the above brief and somewhat incomplete description, it can appear for the gamer that painting aboriginal warriors would seem to pose a daunting task – but it need not be!…read on. After having converted and/or prepared our miniatures (described in our previous post) we must decide on the skin tone to use and the method of painting. As mentioned above I prefer the darker brown skin look as opposed to a more reddish-brown color which is less common for aboriginal peoples. This makes life easy for us. My paint of choice is Army Painter Leather Brown color, used as my base skin color and undercoat on the raw lead. A couple of good sprays and the figures are done! Then comes the next step which is a personal choice which way to go. The figures will be getting ‘dipped’ using Army painter Dark Tone. This will provide us with the necessary shading we need as well as the ‘dip’ will darken the skin color of the Leather Brown undercoat to get the right brown skin effect. Some people prefer to paint shades of colors for the clothes that they can dip at the same time ie one dip coat, covering the entire figure. I prefer to dip the figures first – matt varnish; then paint in the clothes, weapons and shields afterwards – followed by warpaint. After this is all done, I hit it again with a flat or satin spray as you choose. I make a few exceptions to this technique now and again by painting the clothes on the figure then flat spray – the rest however is unchanged. The figures themselves are pretty straight forward to paint so this extra step I elect to do. Essentially what I am aiming to do is use the skin as the base color for the clothes, the weapons and finally the warpaint. This means the skin doesn’t need as much attention as perhaps you might think if you choose not to touch it up – I use both methods of touching up, or not, based upon how the figure looks after dipping and flat varnishing. Hopefully the clothes, weapons and warpaint will ‘pop’ so I’m not as reliant on the skin shading effects on the final figure. On some figures that have less warpaint highlighting the flesh is an option to give the figures some more ‘depth’. You can use the Army Painter Leather Brown ‘color match’ to highlight the flesh after dipping. Regards painting the clothes and weapons, this is pretty straightforward, so no further comments required…use your typical natural cloth color paint palette as for any other figure of this type. Shields can be as simple or as difficult as you want. There are so many shield designs that there is no limit to the imagination. Whilst the above comments show that there were tribal guidelines for the application of shield patterns and colors, I prefer to go with some inspiration from these real shields and then use some artistic licence to make the figures look good…this is where you can have some fun with color combinations and free flow designs. A shield can be as simple as being one color such as ochre red (left) or be as complicated a design as you like (right). A simple google search of aboriginal shields will bring up a plethora of hits to guide you as to the many types that typify aboriginal shield art. I recommend you go with what looks good from table distance – so don’t get to flowery with dots everywhere or it might just turn into a mess when viewed 2′ away…less is more! Using the same principal as for my shield designs ie using real warrior war paint patterns to inspire and allow for painter’s licence, you can then decide how complicated you want this step to be. 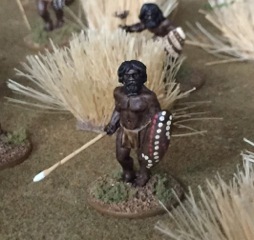 In some respects putting on the aboriginal dot/line painting for me is one of the things that really define them on-table as aboriginal tribesmen and when combined with the unique sculpting look of the Eureka minis, this really pulls the whole figure together and screams…aboriginal warriors! You can apply warpaint using a traditional brush technique – perfectly valid. However I find I just can’t get a consistency in application, size and distribution of dots and lines using freehand painting. For this I turn to my secret weapon – a fine point white pen! Get these from any art shop and while you’re at it, get a good black pen that you can dot paint with as well….and a finer one you can draw with. Bearing in mind the above discussion about how warpaint was used it really is up to you how you want to paint your figures. I go with what works well on the figure. There is no ‘right answer’ to it and you can use a good degree of artistic licence once again to depict your warriors as you choose. The white pen works really well on the dark skin and requires only a light touch to get the flow of ink to give the requisite consistent dot. Experiment on a bit of black paper beforehand to get a feel for the application and flow from the pen. Do the same for the black pen. So you can see that painting aboriginal warriors really isn’t that hard. A little bit of planning will speed things up immeasurably and give you nice consistant results. The following warriors give some examples of the way color combinations have been used and a couple of different paint techniques as well. The real ‘trick’ is to get the non skin parts (weapon, shield, clothes and warpaint) to ‘pop’. This figure has had a ‘green-stuff’ animal skin added and a weapon change. The lap skirt and shield were painted after the figure was dipped. Using solid lines and dots from the white pen. The woomera and spear are painted after the dip so the spear retains its vibrant bright color, in this case, the two Foundry colors 8A and 8B. Lots of dots on the shield. I think I over did it on the dots here which makes the pattern a bit busy…an example of what not to do! A superb sculpt. Body paint really makes this figure ‘pop’. A very basic paint job – perfectly acceptable but less on-table ‘pop’. All colors painted then dipped. This figure is historically accurate to be depicted this way and paints up very quickly…an example of me being a lazy painter! An extremely simple paint job quickly enhanced with dot painting to make it look like a more intricate paint job. A good example of how the shield does all the work on this figure. The basic colors of flesh, hair and spear are super fast to paint and the time spent on the shield makes the figure look good by catching the eye. Compared to the above figure the two models look quite different, though they are in fact the same sculpt with only new weapons added and a stark difference in paint colors. Adding some vibrant colors can help break up your troops all looking similar. The blue, red, yellow and dot painting works nicely in combination. Now that we’ve had a look at the way aboriginal tribesmen can be depicted on-table we shall use the next few posts to take a close look at aboriginal warfare – both traditional and adaptive. We have quite a bit of ground to cover.